I -finally- went to Stay in Taipei 101 (only 101 for friends), the restaurant of Yannick Alléno , the 3* Michelin chef. The place is really nice, bigger than l’Atelier and in beige and maroon. I like the walls and the light especially. The waiters are nice and you can partly see the kitchen. I picked the smallest menu which was already big enough and had exactly what i wanted inside. The “canapés”: tomato bavarian, really fresh and nice, a piece of pork terrine (really small but ir reminded me French ‘charcuterie’), and a tofu piece that i found ordinary. As a starter: Buffalo di Buratta, tomato, basil, crispy bread. It was the best Buffalo i’ve ever had. I love buratta but i never had a real fresh one. I know it’s becoming trendy in Paris and you have some Buratta Bar where you only eat that, but i loved how melting it was with its small milk. The sauce going with it was also nice. The soup: Pesto vegetable soup, bacon, parmesan stick. I liked the stick and the bacon in the soup that gave a little flavor in the pesto, however i found the pesto a little too oily/greesy in mouth, so i didn’t fully enjoy it. The flavors were here, not the texture. Endamame “fricassée”, fresh mangos, lemongrass and curry emulsion, crispy onion. I liked the dish very much, even though i’m not a fan of emulsions, but the curry and the beans were just nicely done. Pan fried Amandai, spring onion, shellfish and yuzu sauce. The sauce was delicious. That was the best thing in the dish. For miniardises, we had a small lemon pie and a chocolate puff cream. The puff was ok, a little too wet for me and the lemon pie was nicely done. As for dessert, i was greatly surprised. First it was chocolate, and truthfully, if i can, i prefer to avoid chocolate desserts. ut this was actually more a fruit dessert than a chocolate one: Chocolate fuseau, fig ans raspberry jelly-sorbet, egg white, fresh mint. It was really delicious, the chocolate flavor was really light, but you had the whole sorbet that popped up in your mouth. The mint and the egg white together were also a good harmony with the sorbet. The macaron with the coffee, spritz and cinnamon biscuit however was pretty bad. The shell were empty and broke too easily. The sptiz was ordinary, only the cinnamon biscuit was nice. Another round. I still have a few left and i will have try everything i wanted to. I went to look at Jean-Paul Hévin’s shop which was just next to this one, but there were only macarons and chocolates, and 135NTD (3,55€) a macaron it’s just a joke, especially when it’s less than half the price in France (1,45€). I think that people start to get a little bit crazy. Macaron is still in the end only an almond shell and a ganache or a cream, and it doesn’t ask as much creativity as other pastries, since they always look the same. 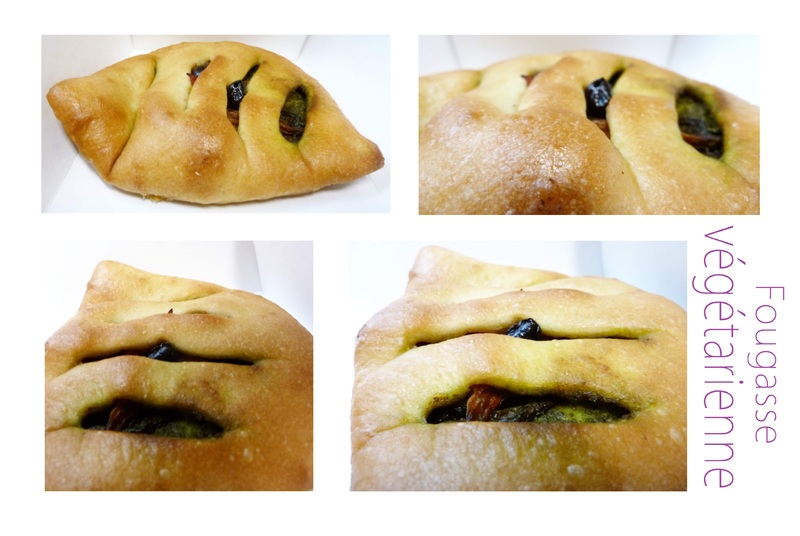 It only ask for creativity in flavor, and to adjust the ingredients, which you also need to do everytime you create a pastry. So in the end, you have less to do, but it’s crazily expensive. Even though it might be difficult to make, it doesn’t justify this crazy price. I don’t really like macarons, and when i see how people go crazy for it, i like it even less. Anyway, today is the third round at Sweet Tea. I chose a mini marbré. The pastry chef seems to like gold, because he puts gold in all his pastries. The cake is nice, but too sweet. The melted chocolate that covers half of the cake (i love the idea by the way) is a way too sweet so it spoils alittle bit the taste of the cake. Except that, it’s nice. The problem i have with those cakes made by good pastry shop is that they are supposed to be cakes for travel, but here it looses all the simpleness and the raw aspect of the product. Of course it’s nice, but it looses the traditional aspect and the childhood memories. 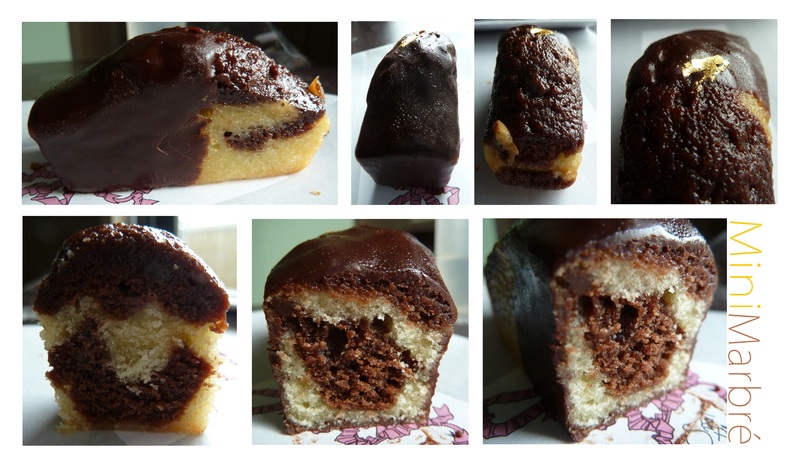 Well, the second one was a Pain au chocolat but with a difference that the pastry dough was also in chocolate. I like the chef here because there are a lot of unique ideas, but it still needs a few adjustments if i may say. The dough was indeed to weak. Usually it should be a little friable and crispy, but here it wasn’t. I know that the weather is an important factor and that Taiwan is really bad for viennoiseries and dough since the weather is so humid, but i was a little disappointed. The taste is here thoug, you really taste the chocolate. The third one was a chocolate and caramel tart. 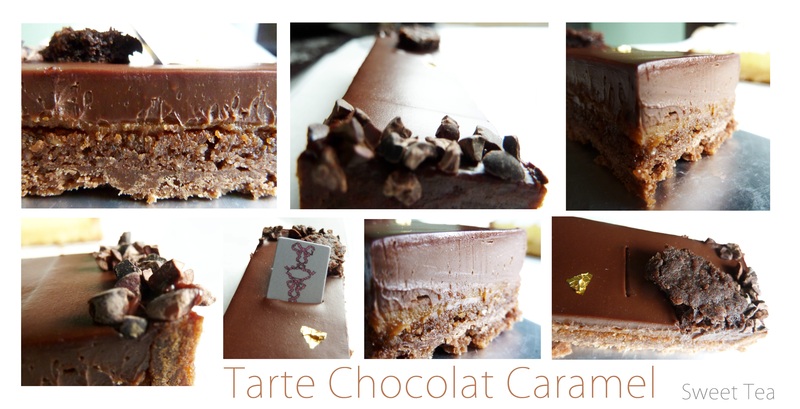 The chocolate ganache was too weak, overtaken by the caramel, you couldn’t feel all the flavors clearly. The caramel wasn’t as good as Sadaharu Aoki’s one. The pastry wasn’t really interesting. But again, i’m not a chocolate lover. 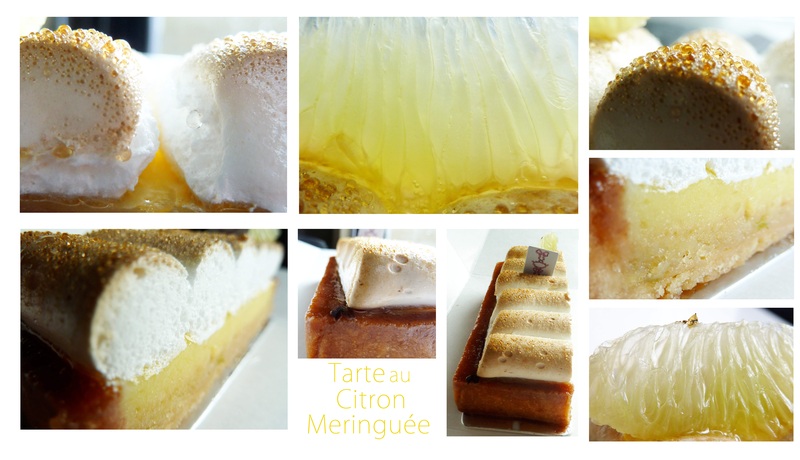 The meringue lemon tart. This one was nice! The meringue was cloudy like, not chewy at all, agreable in mouth. The lemon cream would have been a little stronger in taste it would have been even better, but that’s my personal preference. Tthis one is a really good lemon tart, and really beautiful too. For today, the lemon tart was nice, but the rest wasn’t that great. 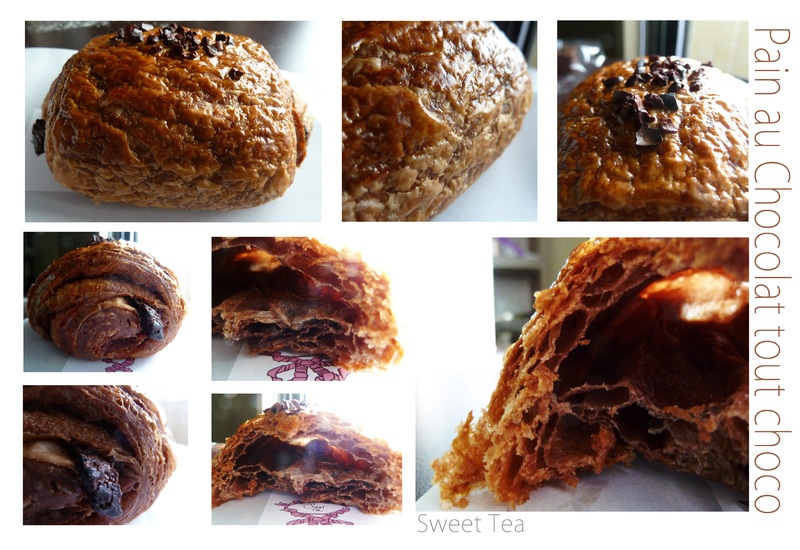 The second one is the marbré, then the pain au chocolat and the less interesting was the chocolate caramel tart. I was started to desesperate to find any other good pastry shop except Sadaharu Aoki, but it came that i was worrying for nothing. Actually, Alléno Yannick, the 3 stars Michelin chef of Le Meurice, has opened a restaurant in Taipei 101 this year, and he also created a tearoom/pastry shop called Sweet tea. So as i really wanted to try something new (i’ve tried everything i wanted in Sadaharu Aoki and truthfully, i prefer classics to “asian” flavor like tea in pastries). 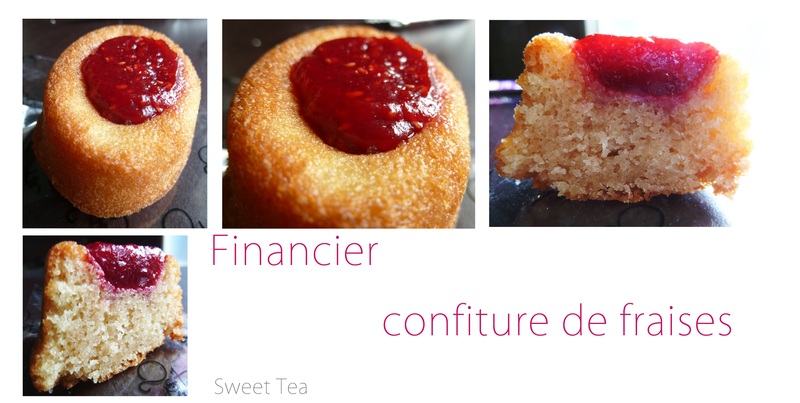 One of the best Financiers i’ve eaten. 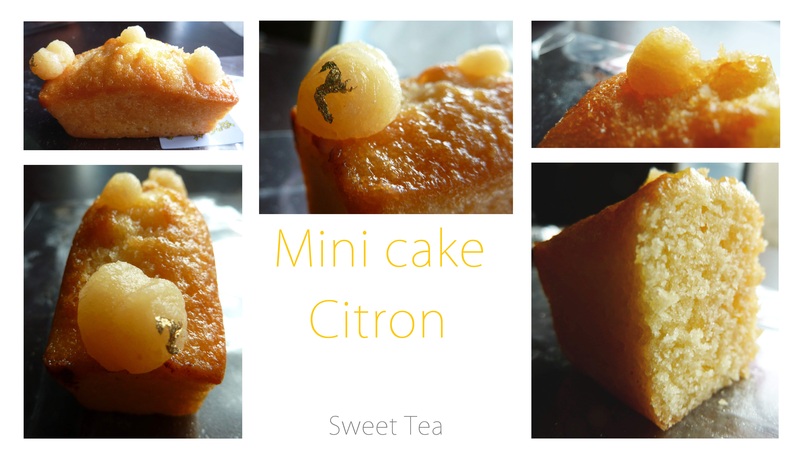 The almond flavor isn’t too strong and the cake is not dry and stodgy as some can be. 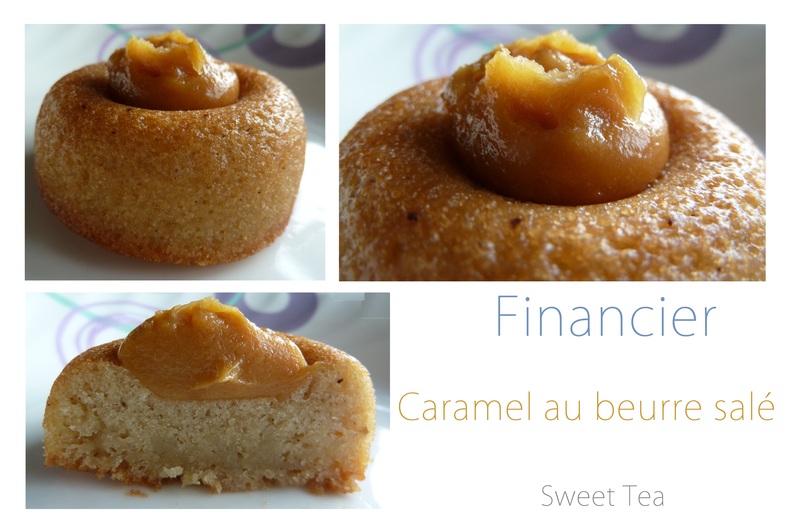 The best thing is the salted caramel cream which makes the cake even meltier. It’s not too salted, and the cream is also really good. Saint-Honoré, the parisian pastry…The piece is small (pastries in Asia are so small…but if the taste is here, that’s ok, however that’s not often the case), but awesome. 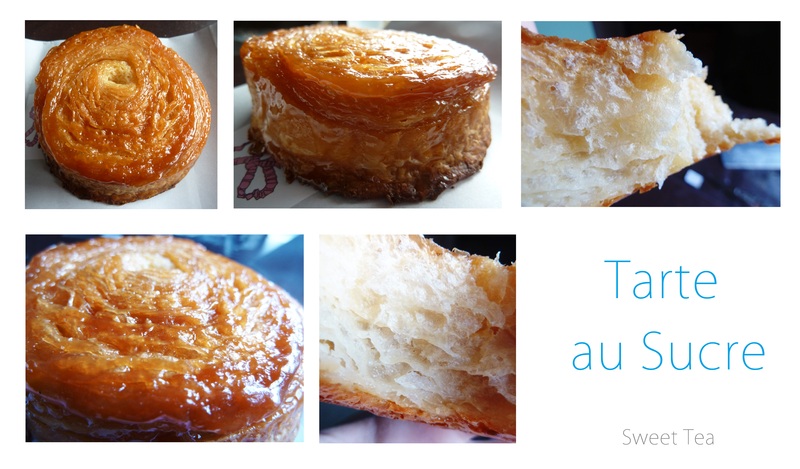 What i love is that it really has the French pastry flavor (can’t really explain what it is) that i miss so much here. The puff are nice and look, the caramel on the puffs is so well-done that you can see my camera lents through it! The only “bad” point i would say is the vanilla. I think it’s another kind of vanilla than usual or they add a different flavor to it, but i didn’t like it as much as usual. I mean it’s good, but not to my personnal taste. The Raspberry-pistachio tart. The tearoom sells it in a very big (10 people) and rectangular shape, just like Michalak does in his restaurant, and then they only cut you one piece of cake (small too). I am not a fond of fruit tarts but this one… You have the raspberries with the pistachio, some drops of liquid sugar on them, a raspberry cream and a almond cream to finish by the dough. The pistachio here gives not only a contrast in colors but also some light crispy in the mouth that goes really well with the raspberries. 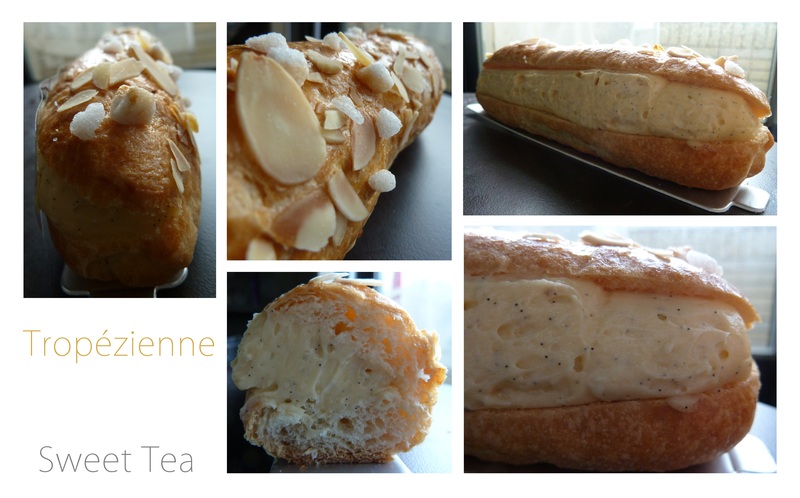 I had never eaten any Tropézienne before, but actually i was disappointed. Not by the way it’s done but by the cake in itself. I didn’t know it was done with bun. 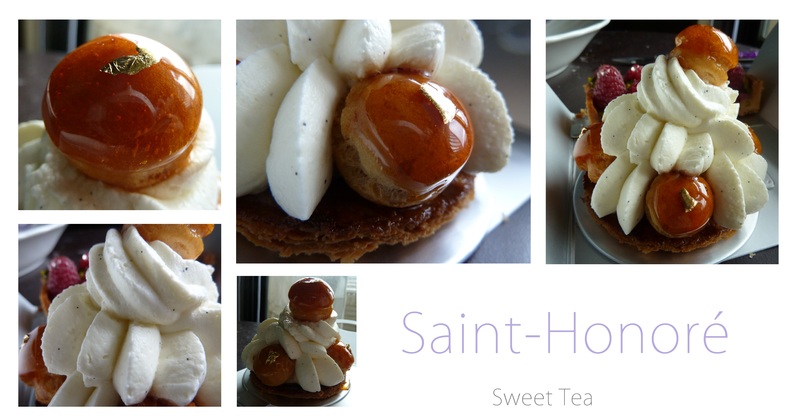 The vanilla cream has the same “different vanilla” flavor as the Saint-Honoré that i am not really fond of. I just think that there is too mush bun for the cream and that it’s a little too heavy. I won’t take any Tropézienne. Today, i went to a sushi bar with my friends. I only picked 2 dishes because i wanted to keep some stapce for the dessert (yeah again but i was -again- depressed and since it was also linked to the day before…). This is nice if you want affordable sushi with good value for money. The two i had were nice, if not awesome. I know that a lot of exchange students go there. My friends recommanded me the tuna which was great because it’s half cooked. I also tried the 2 maki on the right, with dried pork, eggs and salad. They were average. Depending the sushi you pick, you can have ones from 40NTD to 150NTD.